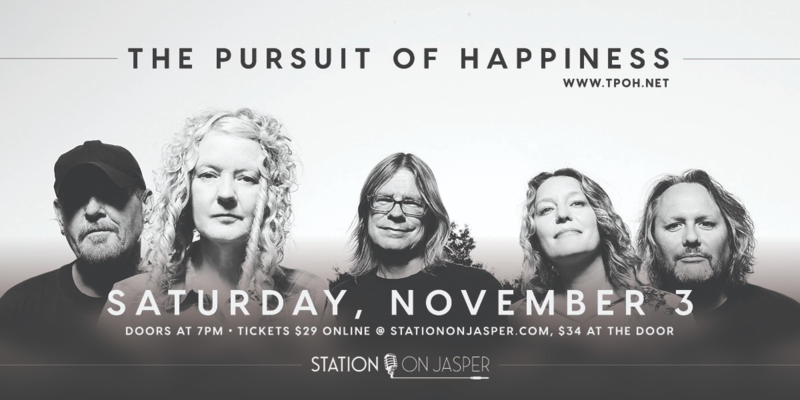 Station On Jasper presents The Pursuit of Happiness. Led by Edmonton, Alberta, singer and songwriter Moe Berg, The Pursuit of Happiness were launched in 1985 when he and drummer Dave Gilby moved to Toronto, Ontario. They soon met bassist Johnny Sinclair and formed the band, adding sisters Tamara and Natasha Amabile as backing vocalists. Their debut single, "I'm an Adult Now", quickly became a smash hit across Canada in 1986, sparked by a low-budget video which made it onto the Canadian music video channel MuchMusic. Although the group never officially disbanded, after 1996 they did not record as a unit until 2005, when they recorded two new tracks for a greatest hits compilation. The most recent lineup has played a few concerts over the last decade, including in a series of shows over the last week of 2005 which ended with a New Year's Eve concert in London, Ontario. In March 2006, they were inducted into the Canadian Indies Hall of Fame. Doors for the show open at 7:00pm, but come in early for some great food and drinks!